After suicide because of the unhappy love of one of his best friends, Carlos Casagemasa, Picasso became depressed. This period became “blue” in the artist’s work, he wrote a number of melancholic paintings. A masterpiece of this period is considered to be the canvas “Life” (1903). When Picasso painted this picture, he was 22 years old, he lived in poverty and constant deprivation, which could not but affect the work of the artist. The canvas was created in a short time, but Picasso initially disliked him and threw him into the farthest corner of the workshop. In the initial preparatory drawings, the man on the left was a self-portrait of the artist himself, but later he replaced his appearance with his deceased friend Carlos Casagemas. A sad young woman who is trying to hide behind a man – Germain Gargallo, the beloved of a deceased friend. 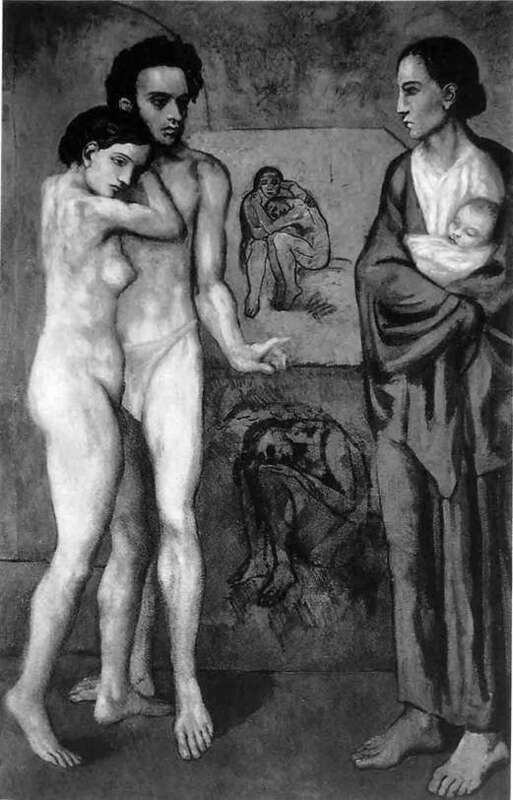 On the right is another female figure full of sorrow – an elderly mother holding a baby in her arms. This is a type of mother Picasso. The film tells about maternal love, which is faced with sensual love between a man and a woman. Emotions on the faces of a young couple tell us about their fear of life, a reminder of the inevitable suffering, illness and old age in the life of every person. The woman in the background embraces everyone with the same man – he is her future or past. At the end is a hunched figure, whose image expresses suffering. All the characters of the picture are in a narrow, squeezed space, blue tones leave the impression of hopelessness and melancholy in the viewer. The canvas is imbued with love and loneliness. The painting depicts life and death, fast passing youth and painful old age. Picasso tried in his picture to reflect the whole drama of life, the truth about the tragic human fate, the complexity of relations between people.